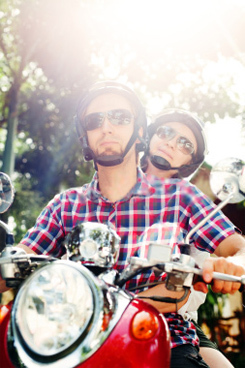 Motorcycle Title & Registration | Renew Registration, Transfer Title | Shirley Katz, Inc. Whether you recently purchased your first bike, or are on your second Harley, we can help make ownership official with our motorcycle title services. With three convenient locations throughout Northeast Pennsylvania you can rest assured that we have a location close by that can handle all of your motorcycle needs. Additionally, with over 30 years of service we have the knowledge and expertise to tackle the most complex cases. So stop by one of our three locations in Stroudsburg (18360), Marshalls Creek (18301), or Brodheadsville (18322), for cheap rates and fast, hassle-free service! Here at Shirley Katz Insurance, we understand what it takes to keep your bike running like new. Don’t let some paperwork hold you back, keep your two wheels on the road with our motorcycle registration services. Since we are online with PennDOT we have the ability to provide you with the lowest prices and the fastest service possible. Stop by one of our three convenient locations, you will walk out our doors with your motorcycle registration in-hand. It’s that easy! Don’t have the time? Perhaps you just have a few questions? Call a Shirley Katz Insurance Inc. representative today!